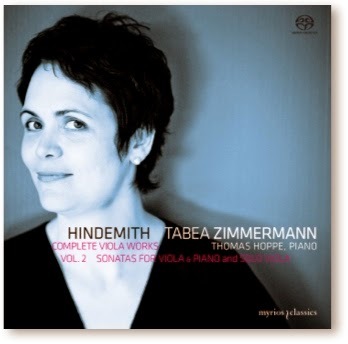 Tabea Zimmermann devoted the first volume of her Hindemith survey to his concertante works for viola and orchestra. This, the second, covers the sonatas, three with piano and four unaccompanied. The works date from 1919 to 1937 and, at least as a first impression, suggest a clear stylistic development from melodic simplicity to gritty complexity later on. In fact, the progression is more complex than that. The first two works, a clear and open textured sonata for viola and piano and a much more introverted solo sonata, sound like they were written decades apart, but in fact they have consecutive opus numbers (11/4 and 11/5) and both were written in 1919. The liner note, by Hindemith expert Dr. Susanne Schaal-Gotthardt, cites both Bach and Reger as influences in the more knotty solo sonata. Indeed, Reger’s voice, as expressed in his own solo violin works, comes through strongly, as does his 20th-centurty reinterpretation of Bach’s models for solo string writing. The op. 25 and 31 sonatas are more in the Hindemith mainstream, filled with clever musical devices, complex but clearly rendered, and beautifully suited to the viola. And the programme ends with two late sonatas, one solo from 1937 and one accompanied from 1939. The music here is more direct, muscular and modern, but melodic and engaging too. As an overview of Hindemith’s compositional output, his sonatas for his own instrument make for a concise and representative survey. Tabea Zimmermann’s performances are excellent. Although Hindemith writes well for the viola, he demands a great deal from the performer. Some of the music is deeply expressive, and is presented as such. One the other hand, some of the music eschews emotion, such as the middle movement of op. 31/4, which is marked “with little expression”, which Zimmermann not only adheres to, but also compensates for with the richness and complexity of her tone. The notes tell us that Hindemith often sidelined beauty of tone in the pursuit of other musical virtues, but Zimmermann insures that her sound, if not always “beautiful” as such, never fails to be interesting, engaging and satisfying. The fast passages hold no terrors for her, although she always retains an earthy quality, a real viola sound, never leading the listener to suspect that she is trying to imitate the violin. Some of the more discordant double stopping is presented in an astringent, throaty tone, but one that is very carefully modulated and served always by immaculate intonation. Pianist Thomas Hoppe also has his work cut out but always rises to the challenge. Hindemith’s accompaniment parts have reputation for being tortuous and needlessly difficult to play, but Hoppe makes them all sound logical and idiomatic. The recorded sound is quite resonant, adding to the richness of Zimmermann’s tone, especially in the lower register. The piano sounds somewhat distant, and some of the detail in its overtones is lost, although the balance between the two players is ideal. The Myrios label is a small and relatively new venture – if the catalogue number of this release is to be believed this is only its 11th disc – but it has poached some big name performers and is engaging them in very interesting projects. All their releases so far have been on SACD, and the engineering on this disc fully justifies that decision; even when hearing just the solo viola, the richness and immediacy of the sound is compelling. Volume 1 of Zimmermann’s Hindemith was very well received: Volume 2 looks likely to attract similar acclaim.